2006 Northwest Division Preview from Maddux Sports. With the NHL Hockey Season now is the time to get aquatinted with the 2006 teams and players. Remember if you are NHL hockey betting look no further, as we offer hockey picks and can help you turn a profit betting on the NHL this season. This is perhaps the toughest division in the league, featuring some of the finest goaltenders, best defenses and most exciting scorers. In the past five seasons, Western Conference titles have gone to the Colorado Avalanche, Calgary Flames and Edmonton Oilers. Now the Minnesota Wild are looking like they could be for real and the Vancouver Canucks may have upgraded enough to compete for the entire pie. The team with the biggest concerns is the Avalanche. Over the past four seasons, the club has been in a slow and steady decline. This season marks another low water mark, as Colorado will be without elite D-man Rob Blake and offensive force Alex Tanguay. With Jose Theodore the primary net man, this could be a season without a post-season for this team. On the other end are the Vancouver Canucks, who have added Roberto Luongo, one of the best goalies in the NHL. Although they are without some key offensive players, the Canucks still have clout in that area. If the defense can step up, they look like a contender. The Minnesota Wild have also worked to improve their lot. With an upgraded attack, continued solid goaltending and one of the best D’s in the entire league, they may push their way into the post season. The Flames still have Miikka Kiprusoff— a massive talent in the goal crease. The addition of Alex Tanguay gives them much more scoring potential. But they still lack a first line center and that could hurt in the long run. The Edmonton Oilers barely made it into the playoffs and then barely missed winning the Cup. But Chris Pronger has moved on and that’s the worst news Edmonton’s young defense could get. Goalie Roloson had an amazing running into and through the post-season in 2005-06, but can he sustain that for a full year? Because the teams in this division are so evenly matched and due to the fact that there have been some impressive improvements amongst the weaker clubs, this is perhaps the most difficult division to evaluate in terms of finish. Enjoy the competition. Click on the team names for the individual break downs for each hockey team. We have compiled previews for all 30 hockey teams. Listed below are individual division previews with predicted order of finish. You can click on the divisional previews and find links to each NHL hockey team containing an outlook for this years 2006 hockey season. 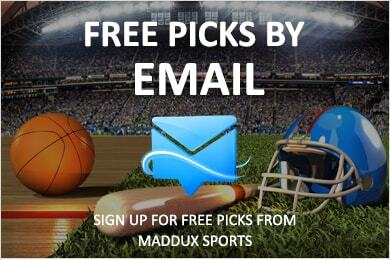 Free Sports Picks from Maddux Sports!